You know that big tank of hot water in your basement? What if we told you that you could get the same amount of hot water (or more) from a water heater the size of a carry-on suitcase—and save at least $100 a year on your utility bill? That’s the promise of tankless water heaters, also called on-demand water heaters, which produce hot water only when you turn on the faucet, start a cycle on the washing machine, switch on the dishwasher, or otherwise call for hot water. While storage tank water heaters are by far the most common type, tankless water heaters are slowly gaining market share, according to Technavio, a global market research firm. That’s because of their reputation for running more efficiently, an appealing characteristic given that heating water is the average U.S. home’s second highest utility cost after heating and cooling the house itself. Consumer Reports recently tested four electric and five gas whole-house tankless water heaters from such brands as Bosch, Navien, Noritz, Rheem, Rinnai, Tempra, and Trutankless to see how costs, performance, and energy use stack up against that of conventional storage tank water heaters. We’ll walk you through the results and considerations of going tankless. Switching to tankless from a storage tank water heater is no easy swap because it requires a plumbing retrofit and possibly an upgrade to your electric service or gas lines to increase capacity. Considering that 90 percent of hot water heater installations take place during an emergency, according to the American Council for an Energy-Efficient Economy, that puts you at a disadvantage when you’re negotiating with a prospective plumber or contractor to make the switch on your tight timeline. But if your storage tank water heater is nearing the end of its useful life and you’re interested in saving space and energy, tankless water heaters are worth a look. “They’ve come a long way,” says Geno Caccia, a third-generation plumber who operates a family business in San Mateo, Calif., with his brother. He says that years ago, when plumbers were less familiar with tankless installations, homeowners complained that they weren’t getting the same water delivery they experienced with their storage tank. “And buyer’s remorse is a powerful thing,” he says. With the help of an outside lab, we conducted performance tests and measured energy use on the nine models we purchased, and calculated installation costs for storage tank and tankless water heaters, as well as how long it would take a homeowner to recoup the investment of a tankless water heater—called the payback time. We based our tests on what’s called a “heavy use” industry standard. “That’s the equivalent of taking several showers, running the dishwasher, washing one load of laundry, and turning the faucet on and off multiple times,” says John Banta, an engineer who oversees our water heater tests. It’s a draw totaling 84 gallons of water a day with a starting temperature of 58° F (plus or minus 2 degrees), and a target outlet temperature of 120° F. “It’s a tough test,” says Banta. Because the differences among models were negligible, instead of breaking out individual models for ratings like we do with most other products, our engineers grouped all the gas tankless units together and all the electric tankless models together, and compared the groups with their conventional storage tank models that run on the same fuel. You can see the results in our water heater ratings charts. Storage tank: Storage tank water heaters typically have a capacity of 30 to 60 gallons, but the most common size is 50 gallons. The capacity you want depends on the size of your household and how much hot water you use (your plumber can help with the calculations). Using natural gas, electricity, fuel oil, or propane, these tanks continuously heat water to keep a full store at the ready. That means you’re paying to have hot water whether you need it or not. Storage tanks can be 5 feet tall or taller and about 2 feet wide or wider. If your water heater is in the basement, you might not mind the space it takes. But if you don’t have a basement, you may have to stash it in a closet—and that can be a tight fit. And keep in mind that because of recent federal energy regulations, a replacement storage tank may take up more space than your old one, even if it’s the same capacity, because newer ones are required to have more insulation. Tanks that hold less than 55 gallons may be an inch or two larger. But tanks of 55 gallons or more will require even more space, depending on the energy-saving technology they use. 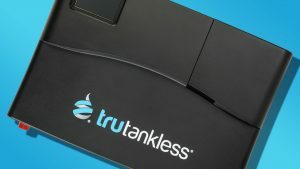 Tankless: As their name implies, tankless, or on-demand water heaters, don’t store water in a tank. Instead they heat water as it passes through the unit, using a heat exchanger to rapidly bring it up to temperature. (They run on electricity, natural gas, or propane.) Heating water only when you need it eliminates the standby energy losses you get with a storage tank. Whole-house tankless units mount on a wall, saving you floor space and fitting into tight spaces. They vary in size, but average about 2 feet tall and a bit over a foot wide. Storage tank: Tank style water heaters are less expensive than tankless. We paid $570 (electric) and $600 (gas) for the two 50-gallon Rheem tank water heaters we tested, but we have seen tank water heaters priced for less at home improvement stores. Tanks with larger capacity or energy-efficiency upgrades cost more. Replacing your old storage tank with a new one of the same capacity is a pretty basic plumbing job, and some homeowners do it themselves. But most manufacturers recommend using a certified plumber, and you may need one because tank water heaters have changed, as noted, to meet tighter energy standards. Depending on what your plumber charges per hour, installation can be $600 to $800 if the existing hookups are compatible. Tankless: Tankless water heaters tend to cost more up front than storage tank models. The nine models in our tests range from $525 to $1,150. Installation will cost you more—at least $800 to $1,500, according to HomeAdvisor. Gas tankless models may have different venting and gas-supply requirements, meaning you may need to increase the diameter of the pipe from the water heater to the gas meter. And electric tankless models draw so much power—120 to 160 amps—that you may have to upgrade the electrical service to your house to 200 amps or more. Manufacturers recommend that certified electricians or plumbers install tankless water heaters. In fact, many manufacturers require installation by factory-trained professionals to maintain the warranty. Storage tank: We included two conventional water heaters in our tests as a control to compare their performance to the tankless units. The gas and the electric storage tank water heaters easily delivered a steady supply of hot water that reached our target temperature of 120° F.
Tankless: We saw a few differences in performance between the gas and electric models. All of the gas units were able to hit our target output temperature of 120° F and have similar minimum flow rates (the amount of running water needed for the heater to kick in). All of the electric models were also able to meet and maintain the set output temperature when the incoming water was 74° F, but two—a Bosch and a Rheem—missed the mark when the incoming water temperature was 58° F. This indicates that electric models may be better suited to areas with warmer groundwater, such as the South. Storage tank: In our tests, we judged the annual energy consumption cost of the conventional water heaters to be Very Good for the gas model and Fair for the electric. Both rate Good for energy efficiency. We calculated that the annual operating cost for a gas model is $245 (based on an average price of $10.86 per 1,000 cubic feet of natural gas) and the yearly cost of running an electric model is $580 (based on an average electricity rate of $0.132 per KWh). Tankless: Gas and electric tankless water heaters run more efficiently than the conventional water heaters of the same fuel type. We rated the annual energy consumption cost Excellent for a gas model but only Fair for an electric, but both rate Very Good for energy efficiency. Using the same rates above, the annual operating cost is $195 for a gas tankless and $535 for an electric. Storage tank: Our payback calculations are based on replacing a 50-gallon storage tank water heater with a tankless water heater, then calculating how much the tankless model costs to operate and how much energy it saves. We used the installation of a tank water heater as the benchmark. Tankless: We factored in an installation cost of $1,250 for a gas tankless and slightly less, $1,150, for an electric. Using a natural gas rate of $10.86 per 1,000 cubic feet, we calculated that the payback time for converting from a storage tank gas water heater to a gas tankless ranges from 22½ years to 27½ years. For an electric model, assuming energy costs of $0.132 per KWh, the payback time to replace a conventional electric tank with an electric tankless ranges from 12 to 20 years. Caccia, the third-generation plumber, says that once you make the switch, labor costs are less for replacing an old tankless water heater with a new one than for replacing an old storage tank with a new one. In part that’s because removing a large tank takes more time and effort than removing the much smaller tankless units. While tankless water heaters run more efficiently than storage tank water heaters, replacing a tank water heater with a tankless can be expensive, and the payback time can be longer than the warranty. “If you have a warranty of 12 to 15 years, which is typical, it doesn’t make financial sense to replace a tank water heater with a tankless,” says Banta. If you have hard water, like many regions of the country, periodic flushing of the heat exchanger to remove hard-water deposits is necessary. It’s also important to clean out the sediment filter on the heater from time to time. If you hire a plumber to do this, it can cost $300 or more. How often you flush your tankless water heater depends on the quality of your water. “If you live in a poor-water area, we suggest maintenance once a year,” says Caccia. The payback math changes if you’re building a new house or renovating an old one and have a need for space savings, endless hot water, or improved energy efficiency. In that case, installing a tankless water heater can make financial sense because there’s no major retrofitting costs involved. If you depend on electricity to heat your water, you have another choice that’s better than a conventional tank or a tankless water heater. And that’s an electric heat pump. It has a holding tank like a conventional water heater, but sitting atop the tank is a heat pump that captures warm air and transmits it to the water—sort of like a refrigerator working in reverse. Basically the heat pump is moving heat from one place to another rather than generating heat itself. That’s why it’s so energy efficient. “Heat pumps also have heating elements like conventional water heaters that turn on if the unit can’t generate enough hot water on its own,” says Banta. We tested a 50-gallon Rheem electric heat pump that we bought for $1,200. Energy efficiency was Excellent and annual operating costs were low, just $240. The payback time for a replacement installation and new construction was under a year. If you’re considering an electric heat pump, check its space requirements. Because the heat pump adds height, the water heater needs more headroom than a conventional tank, at least 7 feet. They also need about 1,000 cubic feet of surrounding air to draw from, about the amount circulating in a 12-by-12-foot room. This is an article reprint from Consumer Reports.